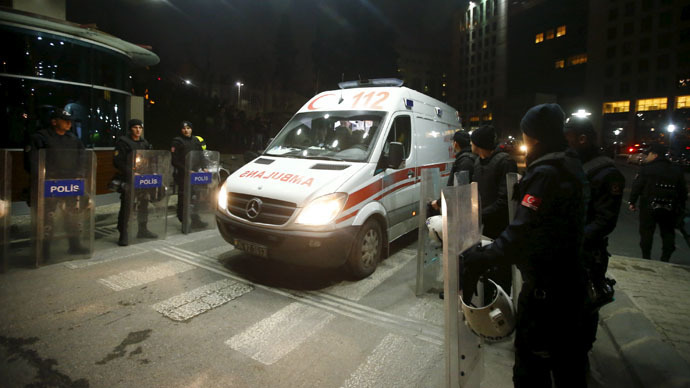 A British man has been arrested on suspicion of having “close ties” with a far-left militant group in Turkey that killed a prosecutor in an Istanbul court siege last week. Stephan Shak Kacynski, a 52-year-old British national of Polish origin, is accused of having links with the banned leftist Revolutionary People's Liberation Party – Front (DHKP-C), the Turkish newspaper Daily Sabah reports. He was detained Saturday as part of an operation against the DHKP-C, in which 45 homes were raided and 30 suspects arrested. In his statement to the police, Kaczynski rejected accusations he was a member of the DHKP-C, the daily Star Haber reports. He also reportedly stated he was only at the leftist culture center to sleep, where he and several DHKP-C members had been arrested. The Daily Sabah claims he is a spy working for Germany’s Federal Intelligence Service Bundesnachrichtendienst (BND). According to Turkish media reports, Kaczynski was involved in the “activities” of DHKP-C in Germany and Greece, giving instructions to the group responsible for the attack and providing “communications between the DHKP-C and BND,” the Daily Sabah reports. Turkish media, quoting intelligence sources, reported that Kaczysnki often visited Istanbul and “had contacts with various groups affiliated with the DHKP-C.” He was allegedly instrumental in the group’s financing, too. The Deutsch-Türkische Zeitung, a German-Turkish media outlet, reports that Kacynski contacted Hüseyin Fevzi Tekin, the chief of DHKP-C who is imprisoned in Greece. The outlet also says he claimed to be in correspondence with the suicide attacker Elif Sultan Kalsen, who was shot dead during an attack at an Istanbul courthouse last week. These reports have not yet been verified. Senior Turkish prosecutor Mehmet Selim Kiraz was held hostage in his office by two members of the DHKP-C in Istanbul last Tuesday. He and the hostage takers were later killed in a police shootout. Kaczynski is described online as an activist and “freelance journalist” who has been involved with a number of small groups on the British left, including the Republican Communist Network. The DHKP-C, which seeks a socialist state, is listed as a terrorist organization by the US, EU and Turkey. The group was responsible for a suicide bombing at the US Embassy in 2013, in which a security guard was killed.